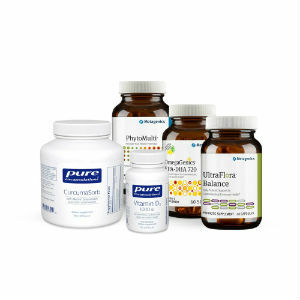 Dr. Kremer personally developed this clinical-grade digestive support program for helping to heal the gut for many of his Functional Medicine patients. The G.I. Fix Program involves "The 5 R’s of Functional Medicine" by first addressing the dietary component through REMOVING inflammatory and problematic foods. The next 4 steps include utilizing specific clinical-grade nutraceuticals to: REPLACE digestive enzymes essential for digestion, REINOCULATE the beneficial bacteria of the gut, RESTORE the integrity of the gastrointestinal lining and REBALANCE the body’s immune and inflammatory responses. This 30 day program will allow you to “wipe the slate clean” and create a fresh start by improving the health, integrity and function of one of your most vital organ systems – your G.I. tract. In addition to restoring your digestive tract, you will be rebooting your metabolism, detoxifying your body, improving nutrient absorption, pinpointing and reducing food sensitivities, increasing energy, reducing aches and pains, improving mental clarity and experiencing just how well you are capable of feeling. Stop by our office to pick up a kit or visit: www.restorativeblends.com to order online. Other Restorative Blends supplements involve a gluten-free supergreens blend (Armor) for enhanced bioavailable nutritional support as well as "Fit Mind" which aides in brain function and mental cognition. 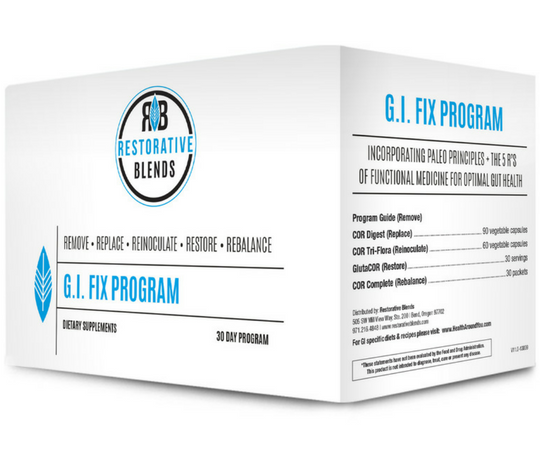 All 3 components complete the perfect restoration protocol for restoring gut and brain function, reducing inflammation, and enhancing nutritional uptake. These are all key factors for someone with an autoimmune disease, overall poor health, or those who have undergone chemotherapy for cancer treatment.